I am sooo glad I reread this book. I wasn’t all in love with it the first time round (a 7!) but this time I had new insight into Steinbeck and his most famous work of non-fiction. I’d heard that the trip Steinbeck and his dog took was largely fabricated and as a result was kind of looking for clues about that – I tended to agree that the actual trip was bogus. But on this reading I came to a surprising conclusion – although Travels With Charley is not a travelogue as I know travelogues, it’s a marvelous memoir of a changing America by one of its pre-eminent writers. The first time I read Travels With Charlie was in January of 2010, over the Martin Luther King 3-day weekend which coincided with Ruby’s story in New Orleans. I liked it okay back then – but not very well really. The review is in the Prior Reviews page for 2009/10 (a few of them are there). I said nothing about its being at least partially fabricated at the time. It seems that current research has concluded that Steinbeck never really made the trip. I do remember I wondered at the time I read it. Finally, in September of 1960, after many months and pages of preparations, (PART I) Steinbeck set out from New York City. The plan was to go across the wide northern country through Pennsylvania and Ohio then dip into Chicago and off to Wisconsin, North Dakota, Minnesota, Montana, Idaho, Oregon and Washington. From there he would head south through California, across Arizona and New Mexico to Texas, to Louisiana and finally back home by Christmas. That’s quite a trip. So I guess I have to forgive Steinbeck for misrepresenting his book. There are so many other supposedly non-fiction memoirs out there which don’t do nearly the job Steinbeck’s does. And from what I understand Steinbeck’s heart had been in it but his flesh was 58 years old and had been very ill. He’d crossed the US many times over the years – he knew the landscape (maybe not North Dakota). (heh). I think the business of “fiction/non-fiction” bothers people who are very attached to the book. I’m not terribly fond of Steinbeck after East of Eden – he seemed to turn a bit bitter – I like him better for having reread this book (another unexpected outcome). Furthermore so much of the book is general that it might just as well be a memoir of people and places – some names changed to protect both the innocent and the guilty – likely more guilty folks in Steinbeck’s weary eyes. The part about the turkeys in Wisconsin is more about the turkeys he remembers growing up. The Minnesota waitress could be almost any dissatisfied person or one person putting another down thinking it’s funny. The North Dakota actor has nothing really to do with ND – he’s an itinerant performer – I figure Steinbeck might have known a few in his California days or the New York ones. I wonder if that’s where he got some of his information. He wrote for them but I can’t find out what he wrote! New York Times – Unmasking Writers Of the W.P.A. “Yet to many, the guide series are treasures. William Least Heat Moon said he wouldn’t have written ”PrairyErth: A Deep Map” (1991) without the Nebraska guide. When John Gunther hit the road for his memoir ”Inside U.S.A.” (1947), his suitcase bulged with W.P.A. Guides. 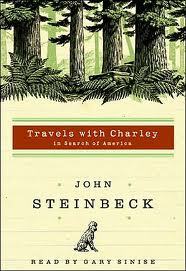 So did John Steinbeck’s when he set out to write ”Travels With Charley: In Search of America” (1962). Later – there’s so much in the book about Charley – that’s an appeal to animal lovers in general – memoirs about my animal. Then comes the digression on hairdressers. Excuse me, where does this take place, Idaho or Oregon, I think. This is not a travelogue – it’s a memoir – because now comes the part about Rocinate – the truck. There are a few travelogue type sections in the book – the Redwoods of California is one of them – I’m sure Steinbeck visited prior to 1960 – after all, he was raised just a couple hundred miles down the road. They made a Native Son. Family fighting about politics is not usually part of a travelogue. (LOL! ) And the rest of the California trip is nostalgia, coming to grips with the reality of his current self in relation to Salinas and a quick leave-taking. He heads to Texas. 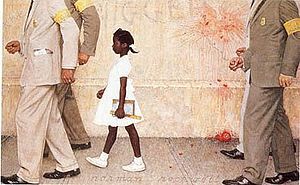 See the Norman Rockwell museum site for more about Ruby’s teacher and Ken Laird studios for more info about Steinbeck in relation to the painting. Apparently Steinbeck was so incensed he wrote quoting the “cheerleaders” as saying truly vile things. These had to be edited out. He knew they would be. But they’re still available at Reason.com. The whole segment doesn’t sound realistic at all – Imo, this isn’t travelogue – this is memoir, politics, whatever. But it’s not fiction. This tells me that perhaps Steinbeck was incorporating other trips into this book – that these are memoirs of all his travels – with and without Charley. And then he’s in Virginia with only about 600 miles to Manhattan and after that the trip is a blur – he remembers nothing. He just wants to get home.